FlirtNow.Com, Helping you achieve through flirting! Thanks so much for visiting my website! I am thrilled to help you connect with the magic in people and life -- you are destined for joy, purpose and success! Check out my books, seminars, CDs and much more. 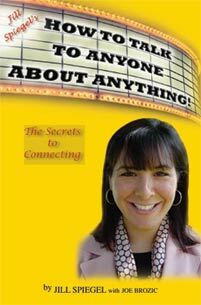 Now let's get started with some energizing thoughts and tips. .
"Jill Spiegel’s How To Talk To Anyone About Anything! The Secrets to Connecting"
• What you tell yourself, you become. Send yourself empowering mind messages: I am confident. I am positive. I appreciate the gifts in everyone, and they see the gifts in me. Our thoughts create our destiny! • Reach out and start positive conversations. Someone standing next to you in line could lead you to your soul mate, your dream job, a life lesson and more! Life magically puts people in our path. • Say "Hello" to new faces as if you've known them forever. Warmth is contagious. You'll feel like old friends. • Look for the miracle in every encounter. • Connect with your imagination. Everything that exists today began with one simple thought. • Listen to your intuition. Inside all of us is a wise guiding inner voice. You can call on yours anytime by asking yourself, "What would wisdom say to me now?" • Remember, life is rooting for all of us!